As you guys know that I use sheet masks daily. But every so often I like to test out patches to that help with other areas of my face and body. I've been collecting patches for a while so that I can write a quick mini review on each mask. I received all these in past Memebox orders and today I will be review each one. All of them are under $3 and all currently available on Memebox. "The neck is one part of our body which is usually overlooked in terms of skincare. This results to appearances of unwanted spots and wrinkles that makes the skin look old. Now, you can kiss these worries away with Help Me Neck Patch from Tosowoong. This neck patch has Adiposlim as its key component which is an active ingredient that effectively firms the skin and restores its smooth and soft texture. This neck patch also contains several premium organic ingredients such as Quinoa and Berry extracts that provide rich nourishment to the skin. This helps maintain moisture and prevent early signs of aging. This neck patch is highly recommended for people suffering from loose, sagging skin, dry skin and dull skin." I still don't understand the point of neck patches. But if you need one I guess this one held up pretty well. "Mediheal's EGT Timetox Ampoule Mask gives the effect of fillers and botox in which it firms and lifts the skin to improve its texture. It transforms dull and wrinkled skin to smooth and sft skin with its premium blend of natural herbs extracts, EGF and peptides. These ingredients promote skin elasitcity by strengthening and firming skin tissues. This ampoule mask is free from harsh ingredients and is therefore safe and suitable for people who suffer from sensitive and aggravated skin." This comes with two traslucent patches that you apply on your smile-line area. My honestly thought these would be sliding everywhere but it was the complete opposite! The patches stayed on thought the whole application ! Not once did they slip off! "A nourishing skincare patch infused with rich natural ingredients that improve skin firmness and texture that results to smooth, soft and youthful skin. 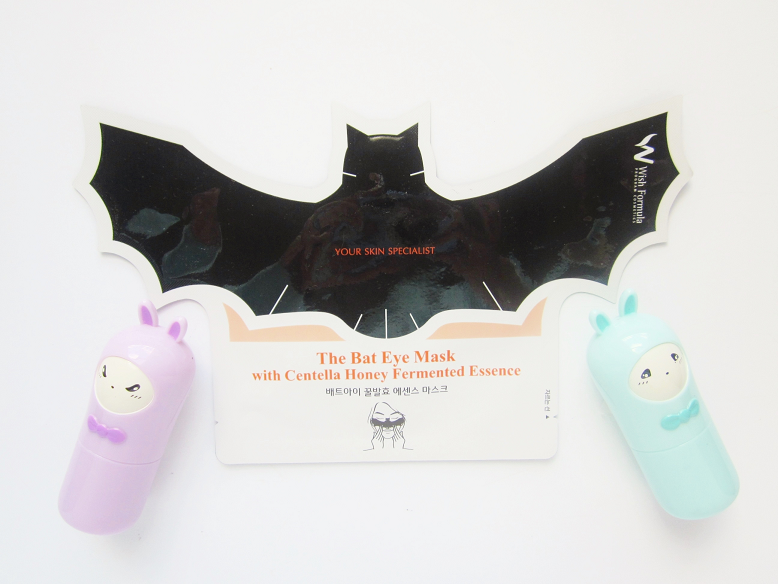 It features Vitamin C, Adenosine, Centella Asiatica and Fermented Honey to provide exceptional anti-aging effects that are mostly prominent on the Bat Eye zone. This gives an instant soothing sensation while fully nourishing the skin from deep within for a more relaxing skin treatment. It also supplies a rich amount of moisture to keep the skin well-hydrated while also brightening the skin tone for a more even and healthier complexion." The mask was black and felt like a regular charcoal mask. i centered the bat and let in soak into my face for 20 minutes. Afterwards I saw no difference though. It didn't brighten or take any puffiness away. I barely noticed a different in skin texture. Maybe it made my skin soft, maybe it didn't. Either way it wasn't rememberable. It wasn't effective, so no. What other sheet masks do you use, besides face masks?